Here's Why You Need A Hardware Wallet | How To Protect Your Crypto! Wondering why you need a hard a hardware wallet? When it comes to cryptocurrency, security is a big deal - and that’s exactly how hardware wallets can help you. I’ve written this article because I want my readers to be protected from hackers, malware and malicious software. Security should be one of your main priorities when it comes to cryptocurrency. So in this guide, I’ll reveal why you need a hardware wallet. I’ll also run through some of the disadvantages of hardware wallets, and what you need to be aware of too. 1. What Are Hardware Wallets? 2. How A Hardware Wallet Works. 3. 7 Reasons Why You Need A Hardware Wallet. 4. Hardware Wallets Are Perfect For Hodling. 5. Crypto Hacks Are Rising. 4. Where To Buy A Hardware Wallet. 5. Disadvantages Of Hardware Wallets. 6. Hardware Wallets vs Exchanges. 7. How To Get Started With A Hardware Wallet. Hardware wallets are basically just a way of storing your cryptocurrency offline - therefore protecting you from hackers and malware. If you want to access the funds in your hardware wallet, you can simply connect it to a computer via a USB, enter your pin and see your balance. By the way, if you’re not familiar with hardware wallets, these are basically USB devices encrypted to increase the security of your cryptocurrency holdings. If you’re invested in cryptocurrency long-term, then hardware wallets are a must-have - yet most people still don’t use them. Hardware wallets store your cryptocurrency offline - they’re also known as ‘cold storage’. You simply plug them into your computer via a USB, create a passcode and unplug when you need to. When you connect your hardware wallet to your laptop, they’re designed to stop malware transferring between your hard drive to your laptop. Most people don’t trust cryptocurrency exchanges because so many have been hacked in the past - see Mt Gox for example. That’s why hardware wallets are becoming so popular. There’s never been a case of a hardware wallet getting hacked. Even if you lose your device, you won’t lose your cryptocurrency. Instead, when you set up your hardware wallet, you’ll get a recovery seed that you can store offline - which you can then use to restore your crypto on another device. Hardware wallets work with most major operating systems - like MacOS, Windows and Linux. Hardware wallets are typically subtle in design and look just like a normal USB stick, so most people won’t recognise what they are from the look them. This obviously stops you being a target of theft. 1. Most Exchanges Aren't Very Secure. Exchanges aren’t secure and that’s one of the main reasons why you need a hardware wallet. Countless cryptocurrency exchanges have been hacked. Mt Gox is one of most notable exchanges to get hacked - but many, many more have been too. You have to realise that crypto exchanges aren’t regulated - they’re not like banks where you’re guaranteed your money back. And when these exchanges get hacked, you usually don’t get your money back - it’s gone. Forever! So if you’re investing long-term, don’t make the mistake of thinking that your crypto is safe just because you’re using a third party exchange. 2. Hot Storage Is A Security Time Bomb. OK, I know John Mcafee hasn’t got the greatest reputation! However, when it comes down to security, he knows what he’s talking about. He’s basically the original pioneer of digital security. 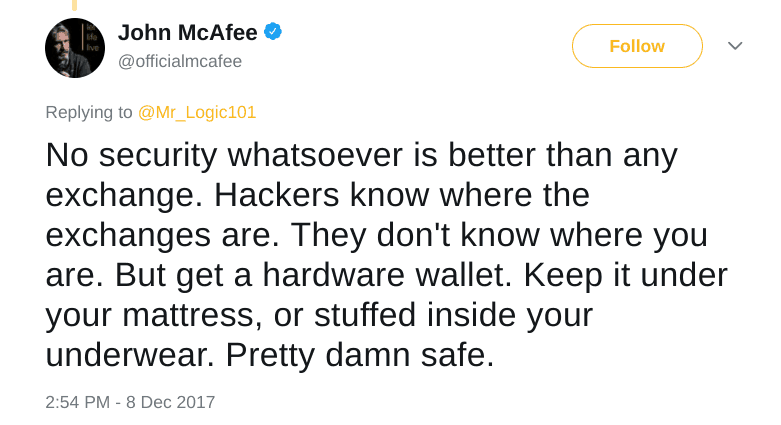 And as you can see in his tweet below, hardware wallets really are the only safe way to store your cryptocurrency. Because you don’t use one, then it’s not a case of ‘if’ your cryptocurrency will get hacked - it’s a case of ‘when’. Storing your crypto online is like a ticking time bomb waiting to blow. Do you really want to take that risk? 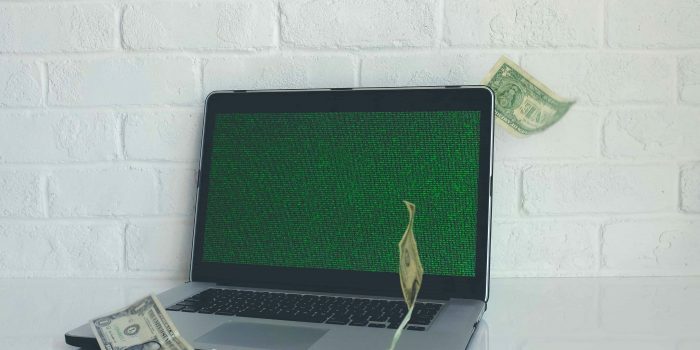 Malware is a serious threat when it comes to cryptocurrency. This is basically software that can install itself on your phone or your computer without you even realising it. When you’re sending cryptocurrency to another wallet address, malware can actually hijack your transaction and send it somewhere else. This means you can easily lose your cryptocurrency investment - it’s the modern highwayman! The only protection against this right now is a hardware wallet. These are encrypted to protect against malware, even if your laptop contains a virus. Hardware wallets like the Ledger actually confirm your destination wallet address before you process the transaction, which you can then double check. If you’re investing for 6 months or more, hardware wallets are a must have. Most cryptocurrency investors like to HODL long term. If you’re one of those people, then you don’t need to constantly access your crypto and therefore storing it offline is a great option. Plus, hardware wallets even make it easier to HODL because you won’t be able to constantly play around with your investment. You can simply setup your hardware wallet and leave your cryptocurrency stashed offline without the need to worry about maintaining it all the time. Crypto hacks aren’t just a one-off or a fad. Cryptocurrency attacks are on the rise and I believe they’re only going to become more and more common. Well with cryptocurrency becoming more and more mainstream and the rising value of cryptocurrencies in general, hackers are only going to get smarter. Hackers realise that the ‘average joe’ doesn’t understand how to protect their altcoins. Even more shockingly, there’s still a lot of investors who don’t even add 2FA authentication to their exchange account - let alone know how to set up a hardware wallet. And because of that, hackers will see newbie crypto traders as easy targets. The influx of threats to your cryptocurrency is one of the main reasons why you need a hardware wallet. With the danger of malware attacks, viruses and hackers, a hardware wallet will help you sleep at night. It's the only real way to get complete peace of mind. It takes a morning to setup a hardware wallet - but the benefits will pay off for years to come. And everytime you see the headlines of a crypto exchange being hacked, you’ll thank yourself for taking the extra measures to protect your account! Most major cryptocurrencies are supported on a hardware wallet so they’re pretty convenient. Now if you’re holding some of the lesser known altcoins, you’re going to find it difficult to get a hardware wallet that supports all of them. That’s because the technology is so new that’s it’s difficult for manufacturers to keep up and implement security protocols when so many coins are being released. However, hardware wallet teams are constantly updating their software to allow compatability for new coins. And in general, for cryptocurrencies you want to HODl, you won’t have a problem. Before you buy a hardware wallet, just check the product description to see which coins you can store on there and whether it suits your portfolio. They have a huge selection of hardware wallets and they sell the top selling ones including Ledger and Trezor. You can compare customer reviews. Amazon is a neutral third party - so you won’t find biased sales pitches or reviews unlike a manufacturers website. Some hardware wallets on Amazon have Prime 1 day delivery - so you won’t need to wait any longer than necessary to protect your investment. Hardware wallets aren’t perfect! So if you’re serious about buying one, you need to be aware of the disadvantages too. Technical Setup: They can be a little technical to set up but you can find plenty of YouTube tutorials teaching you how to get started. Day Trading: Hardware wallets aren’t ideal for day traders - obviously if you need to access your crypto on a daily basis, it’s not practical to use a hardware wallet. Rumoured Security Issues: There have been rumours of security flaws in some hardware wallets - but to date, no hardware wallets have ever been hacked. Procrastinating: It’s easy to procrastinate buying and setting up a hardware wallet. However, if you don’t want someone to steal your crypto, then don’t take the risk of storing your investments online. Just get it into cold storage as soon as you can! Password Storage: You need to consider how you’re going to store your hardware wallet passwords. Check out my guide here if you want some tips on how to protect your seed number. Pricing: You might be reluctant about spending over $100 on a hardware wallet. My advice is don’t take the risk, as a moderate investment in a hardware wallet now could save you thousands of dollars in the future. Cryptocurrency Support: With 2,000+ cryptocurrencies on the market, not every single one is supported by a hardware wallet. Always check the product description to avoid disappointment. If you're using an exchange, you might be wondering why you need a hardware wallet. And sure, you could store your cryptocurrency online via an exchange - it’s the easy option after all. Plus I know it’s not always practical to store your cryptocurrency offline. 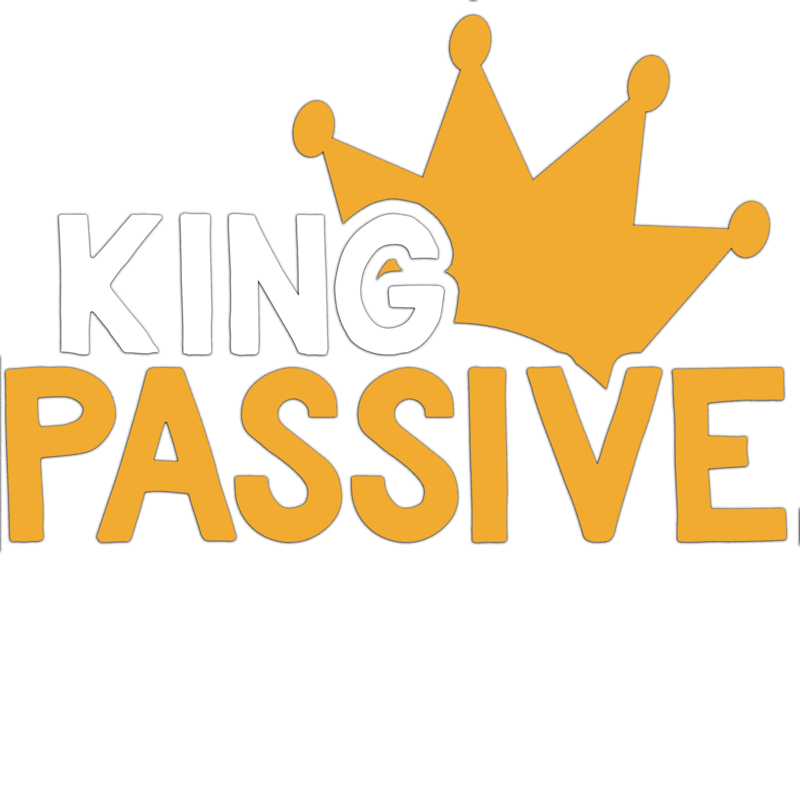 For example, if you’re a day or a swing trader, you’re going to need quick online access to make your trades. But in the long run, hardware wallets are always going to be safer than exchanges. Also, it’s very rare that a crypto exchange will refund your money after they’ve been hacked. However there are signs of this improving, with a recent Japanese exchange refunding $400 million to their customers. Private Keys: One of the biggest problems with leaving your money on an exchange is that until you have your private keys, you don’t really own your cryptocurrency - instead your exchange does. No Guarantees: If your exchange shuts down or gets hacked, then you’re probably (but not always) going to lose your entire cryptocurrency investment. They're Buggy: Exchanges can be quite buggy at times, and there have been some reports by users that their cryptocurrency has gone missing during an exchange. Technical Problems: Some exchanges have been reported to charge commissions on failed trades! And if that happens, they’re usually so overloaded with customer service issues that it’s going to be difficult to get this resolved quickly - if at all. Unproven: One of the main reasons serious investors use cryptocurrency is because they’ve lost their faith in banks. But if you can’t trust a bank to hold your money, how can you trust an exchange? Deregulated: Exchanges are unregulated and often relatively new startups with small teams - so it’s going to be tricky for them to invest their time and capital into the kind of sophisticated security systems cryptocurrency demands. So now that you know why you need a hardware wallet, it’s time to pick one up - which you can do pretty easily online (there's plenty of reviews). But please, don’t procrastinate! It’s really not worth the risk of losing your whole investment. Just imagine all the hours of researching cryptocurrencies, trading and HODLing being wasted simply because you kept putting off buying a hardware wallet! Also, if you want some tips on which hardware wallet to use, check out my guide here.